I finished this wall hanging over the weekend, but it wasn’t received until today and I’ve been dying to post about it! I really, really like it, but realize that the color choices/combinations may not be to everyone’s taste, so I was nervous about giving it away. I was assured that it was appreciated and will be hung up very soon. The appliqué and embroidery were done by hand. Hand appliqué just looks so much better and can be quite soothing. Sometimes. 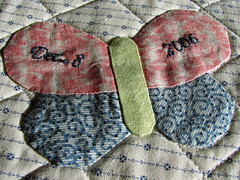 The piecing and quilting were done by machine. After basting all the layers together, I briefly thought about doing the quilting by hand since so much hand work had already gone into it. But then I woke up from my delusion and realized that if I were to hand quilt it, the baby would probably be a teenager by the time I finished. 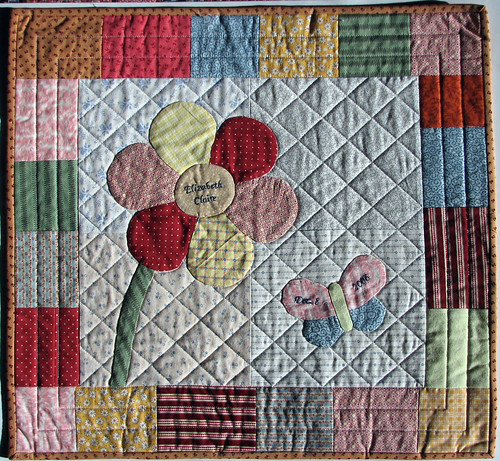 My first idea was to do some echo quilting around the flower and butterfly. I started marking it and quickly realized that it was not the look I was going for. So, I then settled upon some nice straight lines, to complement the curves of the appliqué. I could have done it all with my walking foot and the bar attachments, but I was nervous about trying that over the appliqué, so my perfectionist self actually marked all of the lines and quilted over them. It doesn’t save time, but it does save my sanity. I haven’t been crafting like crazy lately, but I have completed a few projects. Unfortunately, they are all Christmas gifts and I can’t post about them. I’ve also been meaning to post about a few of my handmade Christmas ornaments, but I’m having difficulty finding the time to take pictures of them while there is still daylight. Here’s hoping that I get to it soon.